Conformal coatings are now obsolete! Aculon® offers a range of award-winning waterproofing products for electronics that will protect circuit boards from accidental water immersion and total submersion. Easier to use and more scalable than conformal coatings, NanoProof® performance ranges from accidental water contact to IPX7 and beyond. 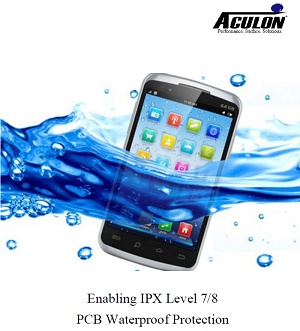 We released the latest Aculon whitepaper, “Enabling IPX Level 7/8 PCB Waterproof Protection,” written by Aculon R&D Engineer Andres Hanau, Dr. Eric Hanson and CEO Edward Hughes, examining the NanoProof qualifications of IPX7 and IPX8 electronic protection. Earlier this month, at the 2019 IPC APEX Expo, Aculon received its third Circuits Assembly New Product Introduction Award for the NanoProof® 8 series PCB Waterproofing! IDC estimates 900,000 smartphones are damaged by liquid every day. Until now, this was a problem without a great solution. Previously, water-resistance product offerings generally fell into two categories: solution-based conformal coatings that repel fluids but require some level of masking or “keep-out” areas, and vacuum-deposited coatings (which also require masking) such as parylene-based treatments. Aculon® NanoProof® surface treatments create a third category – no mask solution based hydro/oleophobic encapsulants that are done on an inline basis and deliver the benefits of a conformal coating yet eliminate the need for costly capital investment and avoiding the bottlenecking batch process of vacuum based manufacturing or masking operations. Aculon® award-winning NanoProof® Series offer customers a range of PCB waterproofing solutions from protecting against accidental water damage (NanoProof® 1.0) to IPX7, immersion in water at one meter depth for 30 minutes (NanoProof® 2.1, 7.0, 8.4), to greater barrier properties that can withstand 100 hours immersion in sweat solutions and some of the most stringent test methods developed for non-hermetic components (NanoProof® 2.1, 7.0 & 8.4). Aculon NanoProof® Series uses a mix of Aculon® Proprietary Transition Metal Complexate technology (TMC) and fluorinated acrylic polymers to achieve a series of products that are compatible with all of the common material types used in SMT parts. Aculon® NanoProof® series are sprayable or dip based treatments that do not require a cure and have no impact on conductivity testing. While some of the NanoProof® series are so thin that they are invisible to naked eye, all of the Nanoproof® series contain a UV tracer to ensure detection at customer sites. Click here to view/download the NanoProof® brochure PDF. Aculon® NanoProof® Series offer customers a range of PCB waterproofing solutions from protecting against accidental water damage (NanoProof® 1.0) to IPX7, immersion in water at one meter depth for 30 minutes (NanoProof® 2.1, 7.0, 8.4), to greater barrier properties that can withstand 100 hours immersion in sweat solutions and some of the most stringent test methods developed for non-hermetic components. The IPX scale was designed to measure ability to keep water out (ingress protection). Aculon® nano sprays allows water in (no ingress protection), but protects the components. Aculon® conducted IPX testing which determined that NanoProof® delivers performance above the IPX-7 benchmark. Sweat testing of NanoProof® treatments per IBM-H6-0440-105 for 24 hours @ 10V to D&F combs, resistance measured pre and post-test, treatments met resistance requirements. NanoProof® 3.0, 4.0, 5.0 exhibited no corrosion. If you are not sure which NanoProof® is right for your application, we offer the following options to determine which level of protection offers the performance you require at the most economical price. Have the experts at Aculon® treat your parts with NanoProof so that you can proceed immediately into qualification. For parts that are complicated, large, or require masking or selective treatment, Aculon® can work directly with you on your application. We will customize a solution to fit your specific needs. Once a solution has been determined, Aculon® will assist with implementation in your facility and bulk chemistry and cleaning solutions can be delivered on a monthly/weekly basis to meet your production needs. How they can sample NanoProof® for testing. Examining NanoProof® qualifications for IPX7 and IPX8 level protection for electronic devices. Every PCB has an Achilles heel: water. Is there a solution beyond conformal coatings? 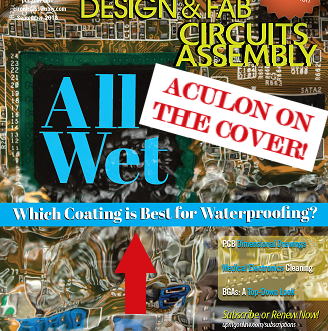 Aculon makes the front page with whitepaper featured in Circuits Assembly September 2018 edition. 1) How durable is NanoProof® ? ANSWER: NanoProof® is designed to provide protection against water and moisture damage. It is designed to have lasting exposure to oxygen/light with great durability. It is not however designed to provide abrasion durability as the substrates it coats are typically contained within an out case and not exposed to abrasive action. 2) Can these treatments be applied over a no-clean Flux? ANSWER: While we have had some customers successfully apply NanoProof® over No-Clean Flux we do not recommend it. The No-Clean flux can prevent proper bonding resulting in delamination and in comparative testing of NanoProof® treated board with & without flux the “without flux” boards universally perform better. 3) Do any options require special spray equipment? Can we use our existing spray systems/equipment? ANSWER: Yes, the product is designed to be used with standard spray equipment. Acrylic conformal spray equipment is optimal. Automated and selective spray equipment can be sourced via PVA or Nordson Asymtek. 4) What is a typical oil contact angle for NanoProof®? ANSWER: As a point of reference: An untreated product, depending on the substrate, would fall somewhere in the 10°-20° degree range. A part treated with 1.0, 2.0, 2.1, 4.0, or 8.4 will have minimal change in oil contact angle. A part treated with NanoProof® 5.1 or 7.0 will have an oil contact angle of about 78° – typically in the high 70°’s. 5) How it is the NanoProof® cured when applied? Is it a UV, heat cure or air dry? ANSWER: Room Temperature drying is all that is typically needed. A heated cure is possible however not recommended as it can cause defects with excessive heat. The longest air dry time is typically no longer than 30 minutes. Drying rates can be reduced by adding air flow. An accelerated dry time via air flow or heat cure typically does not add performance benefits. 6) Which application process is better? Dispensing, manual spray, or dipping? ANSWER: This depends on many factors including: your part size, desired protection level, keep out areas, throughput required, among other things. No easy answer. However in general spray is often preferred for application of 1.0, 2.0, 4.0, 5.0, & 5.1. Also keep in mind, 7.0 & 8.4 can not be applied via spray due to their thick nature and must be applied via dispense or jetting via a selective deposition system from Nordson Asymtek or PVA. 7) What intensity of UV light is advised for UV Tracer? ANSWER: All UV tracers are designed to be detected with a 365 nm UV lamp. 8) We use a specialty coating robotic that needs to be cleaned once done. Are the Nanoproof® treatments easy to clean once the job is done? ANSWER: Yes, we can provide the appropriate solvent for cleaning after use. It is not difficult when utilizing the proper solvent, just like cleaning a paint brush with paint thinner. 9) Is there a high-temperature or UV curing step? ANSWER: No, none required. These treatments air dry on their own and can handle some level of elevated temperature after being applied, however it is recommended as it can potentially cause defects. If you wish to increase the speed of the line, the preferred option is to use increased air flow. 10) Can it be applied over a traditional conformal coating such as parylene in order to obtain additional performance and protection? ANSWER: Yes, it can be applied over conformal coatings. However, this is not something we have tested to evaluate the performance and protection change. Typically the value proposition with use of NanoProof® is replacing a parylene coating with our more cost effective, scaleable, and easy to apply NanoProof® encapsulant options rather than doubling down. 11) Are these materials currently being used in any OEMs or CEMs that we can reference? ANSWER: Yes, they are being used in production with numerous OEMs/CMs; however, due to confidentiality, we cannot reference customer names. These products are commercially available and commercially used. 12) How do you test or check if the coating is on the surface? 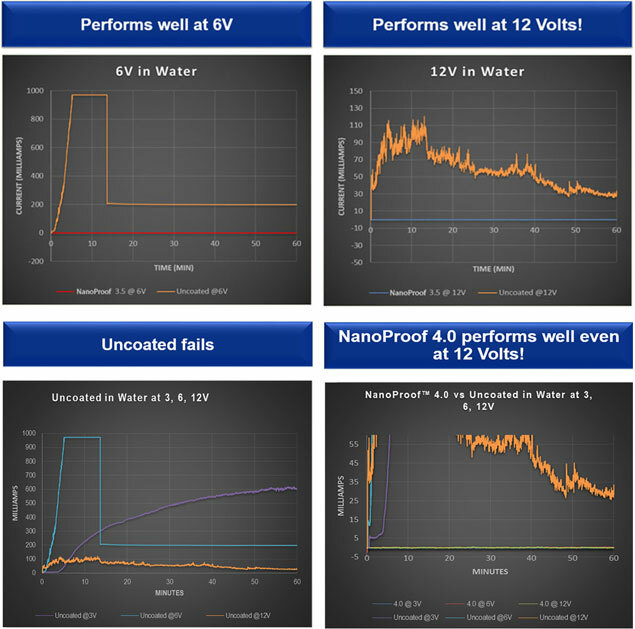 ANSWER: A UV Tracer is added into every version of NanoProof®. The UV Tracer utilized is visible under a 365 nanometer light. For QC purposes, the treatment illuminates blue under the UV lamp which gives an indication of how well you have treated your parts. For qualification purposes it is also possible to test viability utilizing SIR tests and cross sectioning to ensure consistent coverage. 13) How does the UV tracer impact the capabilities of the waterproof treatment? ANSWER: We have not found any negative impact. If a treatment with no UV tracer is desired, this can be arranged. Please inquire for information. 14) Can you dip coat unsealed switches? ANSWER: This would depend on the geometry and function of the switch. In General: Yes, with NanoProof® 1 & 4.0 there is no problem with this. With NanoProof® 2.0, 2.1, 5.0, 5.1, 7.0, & 8.4 – it most likely would not work as these materials set to a more rigid structure. 15) Has any testing been done for protection against steam, such as use in an Autoclave? ANSWER: This is not a problem so long as you do not go above the recommended max temp of 200° degree C. Autoclaves do not typically get that hot. 16) Do connections or solderable surfaces need to be masked? ANSWER: This is dependent on the application and which NanoProof® is selected. No masking of connectors is typically required for application of NanoProof® 1.0, 4.0, & 8.4. These materials are designed around having push thru connectivity at all the times. Even days or weeks later – you can still push through. NanoProof® 2.0, 2.1, 5.0, 5.1, & 7.0 have a limited window for making electrical connections, generally around 10 minutes after application. Once NanoProof® 5.0, 5.1, & 7.0 have set, it is possible to use a bit of diluent solvent (available through Aculon® , please call 858-350-9474) around the specific area to allow for push through connectivity. 17) What are the Carrier Solvents? ANSWER: For NanoProof® 1.0, 2.0, 2.1, & 4.0 the carrier is a Hydrocarbon Solvent. NanoProof® 9.4 is carried in methylcyclohexane. For NanoProof® 5.0, 5.1, & 7.0 the carrier is a fluorosolvent blend. 18) Do we have measured viscosities of the various treatments? ANSWER: NanoProof® 1.0, 2.0, 4.0, 5.0, & 5.1 are very low, less around a centipoise and suitable for spray application. NanoProof® 7.0 & 8.4 have higher viscosities and thus are suitable for dispense and jet applications. 19) Are there disadvantages for a surface that has been over-applied or applied to be too thick? ANSWER: No, only thing to be impacted would be either difficulty with push-thru connectivity or fitment for packages with tight tolerances. 20) Does the applied thickness impact conductivity? ANSWER: NanoProof® coatings themselves are not conductive and are all electrically insulating. NanoProof® 1.0, 4 .0 & 8.4 will be able to push through (allowing electrical connections to be made) with no impact to conductivity. NanoProof® 5.0, 5.1, & 7.0 are a firmer barrier – you will need to peel off or use a softening solvent to re-wet the area if you want to make an electrical connection. 21) If we wish to test the material, how do we obtain it? Direct or through distribution? ANSWER: Contact Aculon® directly and we will work with you to determine the ideal solution and from there can then source test parts/materials. 22) What are some common treatment cosmetic defects which are seen, such as fish eyes or de-wetting. ANSWER: If applied properly all NanoProof® coatings should be defect free. Visible or performance defects are likely the result of unideal application or excessive heat on cure. Your Aculon representative will work directly with you to resolve any issues. 23) Is NanoProof® alcohol and chlorine proof? ANSWER: Performance testing has been done in saltwater (sodium chloride) and NanoProof® performs well. Alcohol will not dissolve the treatment. In short, it shouldn’t have an impact – but along with other liquids that are not specifically mentioned in our tests, we recommend testing if there is concern. 24) Because Parylene is vapor applied and the NanoProof® materials are liquid applied, my assumption is that the edge thickness does not compare to parylene. Do you have any information on this? ANSWER: The NanoProof® 7.0 & 8.4 treatments are specifically designed to have conformal edge coverage when properly applied. In addition the thickness achievable with these treatments via one pass is typically 30-50 uM in thickness which would take a very significant amount of time to build up for parylene. 25) What is the application rate? ANSWER: Every part is unique – so your part may need some process optimization. In general depending on the size and complexity parts can be treated in seconds. 26) Do the treated surfaces remain solderable or can you solder through a treated PCBA. ANSWER: For NanoProof® 1.0, 2.0, & 4.0, in most cases it is possible to solder through a treated PCBA. With NanoProof® 5.0, 5.1, 7.0, & 8.4 the treatment will likely need to be removed to solder. Most choose to utilize selective deposition in these situations to avoid treating the solder pad all together. 27) Do these encapsulants comply with ROHS and REACH regulations? 28) When you make a push through connection does the connection remain sealed? ANSWER: Assuming that the treatment covers the bare metal lead – Yes. 29) What type of PCB handling is recommended or allowed after treating with 4.0? ANSWER: Keep in mind 4.0 is never actually cured and is gel like in nature (allows for push through connectivity!) and should be handled carefully. Once inside of the units enclosure, this is not a concern. It is advised to handle the board by the edges or some other area not requiring protection. In other scenarios a special chuck to hold and/or transport the board without damaging the coating may be needed. 30) Where does the product ship from? ANSWER: The products are manufactured at our facility in California. Orders from the United States market will ship from California. We do have some distributors in Asia who will carry and ship for orders in that area. 31) Can a regular test tape be used to test for adhesion? ANSWER: An adhesion tape test is not really relevant for NanoProof® 1.0 & 4.0 – these are actually still semi-liquid once they are down. NanoProof® 2.0, 2.1, 5.0, 5.1, 7.0, & 8.4, on the other hand, do cure into a hard treatment. So yes, once cured, a tape test can be utilized to test for adhesion. 32) Have you done any accelerated life testing such as what is used in automotive or medical? ANSWER: No, we have not, as this is typically unique per the specific application and performed by the customer utilizing the application specific part. Feedback from customers is that there is not a concern surrounding any testing performed that shows degradation in the life of the board. We have just tested performance in water and salt water and found no impact. 33) How much NanoProof® is needed for a certain size? ANSWER: This depends significantly on the geometry of the part, the application method, the material selected, in addition to other factors. In general NanoProof® is very efficient. We will work directly with you to determine the ideal material, application method, & material usage. 34) When breaking through encapsulant with mounting screws, will water migrate under the coating? ANSWER: No, not in our experience. 35) You mention that NanoProof® allows for electrical connections. Is the treatment itself conductive? thin nature. They will not impact the conductivity of a treated trace. 36) How well does it perform under extreme conditions. – 40°C to 80°C? ANSWER: All NanoProof® materials are stable at this temperature range. 37) Would our products pass Mil 4658C or IPCCC830? For Biocompatible, ISO10993? ANSWER: This testing has not been done at this stage. It is likely they would pass. If a customer with a significant enough project requiring this was interested, we are glad to look into the possibility. 38) Are you planning to test repellency or have you tested for other fluids in the auto industry, i.e. brake fluid and gasoline? ANSWER: Due to the shear # of liquids which can potentially be tested, we have not tested every possible scenario. However NanoProof® 5.0, 5.1, & 7.0 are both hydrophobic & oleophobic – you would expect to see the high contact angles for most oil and water based liquids. 39) If you want to have a thinner thickness for each type of treatment for application what is your recommendation? ANSWER: NanoProof® is designed as a final formulation and is not intended for dilution. The thickness of the coating can be adjusted by modifying the application method. Aculon® can also provide a custom formulation if required. 40) How do you suggest I test if a water proof encapsulant is needed for my part? Also, How do I determine which NanoProof® meets my performance needs? ANSWER: Aculon® has representatives that are eager to support your application and find the best solution for your needs. Contact us now and we will see how we can best support. One of NanoProof® most significant advantages over conformal coatings is the fact that electrical connections can be made through the NanoProof® treatment in many cases. NanoProof® 1.0, 4.0, and 8.4 have push-through connectivity capability, while 2.0, 5.1, and 7.0 allow for push-through connectivity within 20 minutes of treating the board. Do you have a specific thickness requirement? Do you need oleophobicity or solvent resistance? Is full board coverage required or are there “keep out” areas with tight tolerances requiring selective application? Push Through Connectivity: Are there connectors on the board that would be desireable to treat? Can you handle flammable solvents in your facility? Is there a handling requirement post-application that will require a dry (non-greasy/tack & non-transferable) coating?